Thank you again to Eric La Fountaine for today’s entry and write-up! Anemone × hybrida is commonly known as Japanese anemone, but is actually a cross of Anemone hupehensis (native to China) and Anemone vitifolia (native to mainland southeast Asia). A dependable fall-bloomer for the garden, this particular cultivar produces many blooms on tall stems to over a metre high. The large single flowers are a lovely, almost-silvery, pink. Japanese anemones are vigorous growers and form nice clumps. They can get out of bounds, spreading from the roots, or, in some cases, seeding. This photo shows the seed head. 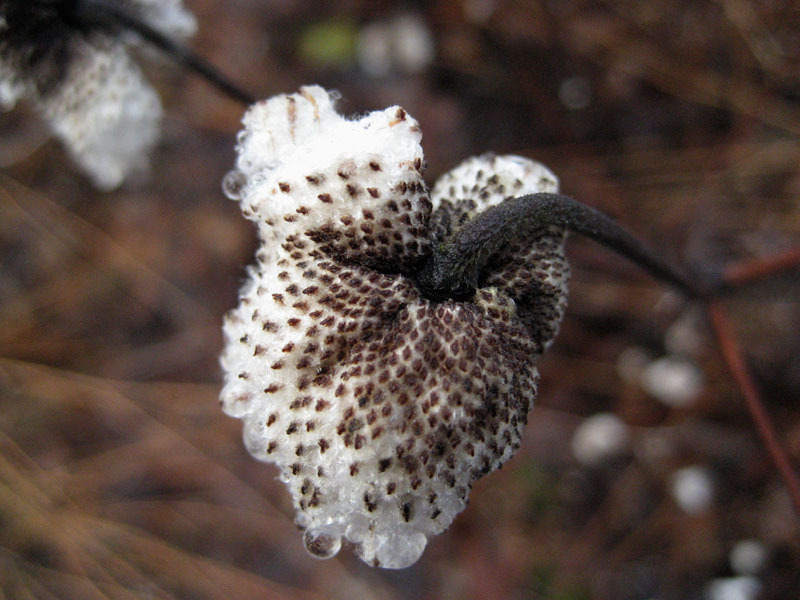 Fine white fibers attached to the seeds help with dispersal. I don’t know if this plant has been a weed problem in the garden, but I did note that it had spread across the path. The seed heads are not often noticed as gardeners tend to trim the plants back in the fall. perhaps its in a book? This is a very interesting plant. The photograph of the seed head is very nice. I really enjoyed reading about the plant.